While the Acer Swift 1 delivers what it promises—a slim and light chassis, plenty of battery life, a solid-state drive and even a fingerprint reader, all for less than $350—it makes painful speed and storage compromises to get there. If you're a bargain hunter who doesn't mind relying on cloud services and you can tolerate merely adequate performance, by all means, give the Swift 1 a look. But if you're looking for long-term value, consider either increasing your budget or tolerating a thicker, heavier laptop with more pep. Measuring 12.58 x 8.86 x 0.59 inches and weighing just 2.9 pounds, the Swift 1 makes for a is pleasingly light, thin, yet sturdy, for a Windows 10 notebook. The Swift 1's display barely wobbles while you're picking the laptop up or putting it down, and the sleek, tapered shell belies the laptop's budget price. We tested the $329 version of the Acer Swift 1, which comes with a Pentium N4200 processor, a quad-core Apollo Lake-generation CPU designed for budget laptops. As we'll soon see, the N4200 is adequate (well, barely) for everyday productivity tasks, but it buckles under any kind of serious processing load. Also inside: 4GB of low-voltage DDR3L RAM and a meager 64GB solid-state drive, which leaves you with only about 20GB of available storage. That might be fine for those planning to use the Swift 1 primarily for surfing the web, running Office and working from their cloud accounts. An Acer representative even told me the Swift 1 is aimed at "people who are likely to use cloud-based storage"). But if you want to install more programs or store even a modest amount of media on the Swift 1, I'd strongly suggest you to cough up another $70 for the 128GB SSD upgrade. The Swift 1 relies on an integrated Intel HD Graphics 505 core for light display tasks such as video streaming, browsing and general productivity. 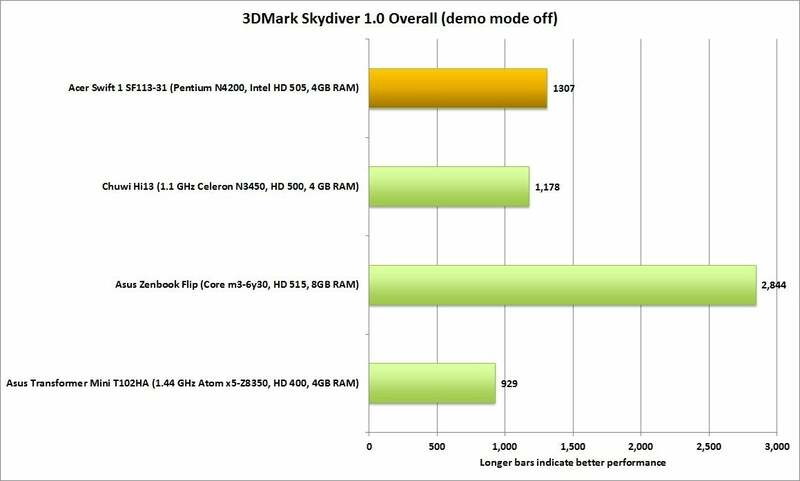 Unsurprisingly (and as its benchmark results will show), the Swift 1 isn't much of a gaming machine. Expect all but the most basic games to chug along at frame rates well south of 30 per second. The Acer Swift 1's 1920x1080 screen looks pleasingly vivid and sharp, more than capable for standard Office tasks and even the dark sci-fi scenes of Tears of Steel (our favorite 4K test video). Viewing angles on the Swift 1's IPS display panel are up to par, with the screen beginning to dim when viewed from an angle of about 30 degrees or more. I was also pleased that colors on the Swift 1's display never inverted, even when viewed from nearly a 90-degree angle. The Swift 1's screen is fairly bright, measuring about 286 nits (or calendas) when dialed all the way up. We think laptop displays need a brightless of at least 250 nits for comfortable indoor viewing, a standard that the Swift 1 clears with a decent cushion, although it falls short of the 300-plus nit readings we've measured on other laptops. The Swift 1’s keyboard felt solid and responsive to my fingertips, with the flat chiclet-style keys delivering a satisfying (but not too noisy) click when struck. There's no dedicated numeric keypad (no surprise on a 13-inch laptop), although there are numeric keys embedded within the main letter keys. Keyboard hotkeys include airplane mode, sleep, secondary displays, and application menus. Missing are hotkeys for search and settings. 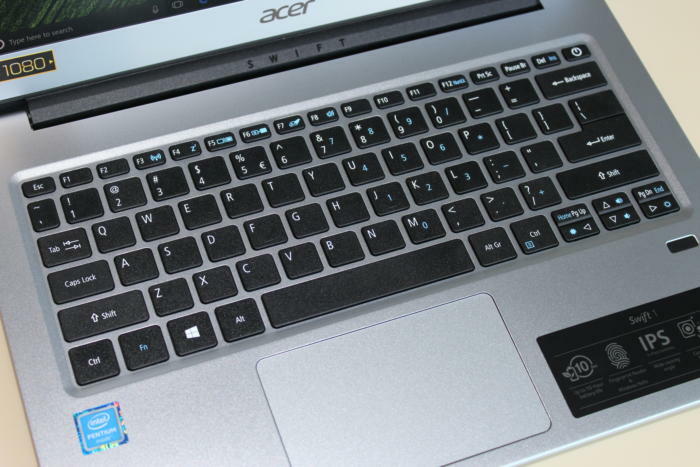 The Acer Cwift 1 offers a fingerprint reader along with the keyboard and trackpad. Unfortunately, the Swift 1's otherwise impressive keyboard comes with a major caveat: no backlighting, meaning that you'll have to feel around for the right keys when you're typing in the dark. An Acer spokesperson tells me that versions of the Swift 1 with backlit keyboards may arrive eventually, but "at this time" they're not an option. The Swift 1's trackpad gets the job done with a minimum of fuss, smoothly registering my taps and swipes. Nearby sits a Windows Hello-enabled fingerprint sensor, which reliably detected my fingerprint during my testing, unlocking the Windows login screen in less than a second. The stereo speakers embedded in the bottom of the Swift 1's shell aren't bad, producing loud, detailed but (as usual for budget laptops) bass-free sound. The speakers cranked "Live and Let Die" by Paul McCartney & Wings without any discernible distortion, while the busy first movement of Mozart's 25th Symphony—a track that some laptop speakers can't play without crackling—sounded relatively crisp. The Swift's 640x480 webcam does a decent job, with images looking expectedly grainy and blotchy but otherwise perfectly fine for basic video conferencing. 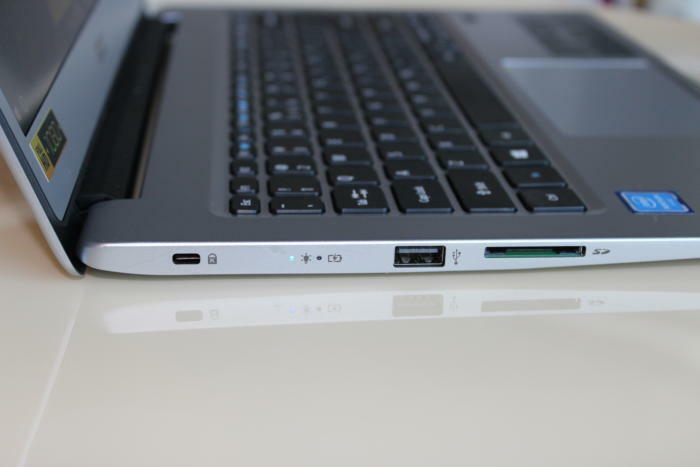 The Acer Swift 1's left side holds USB-A and SD card ports, plus a lock port. On the left side of the Acer Swift 1, you'll find a USB 2.0 port and an SD card reader, while on the right side sits a pair of USB 3.0 ports (one of which supports "power-off" charging of other USB devices), a USB 3.1 Type-C Gen 1 port, a headset jack and a full HDMI port. Unsurprisingly for a budget ultra-portable, the Swift 1 lacks Thunderbolt, mini-DisplayPort, VGA and ethernet ports. The Acer Swift 1's right side holds two USB-A and one USB-C ports, a full HDMI port, plus an audio jack. 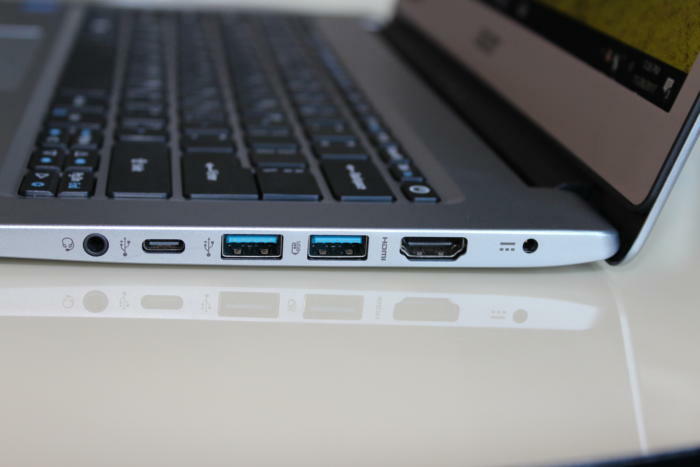 Small, fast, and cheap: Those are the three main qualities we wish we could get from any ultra-portable laptop, and generally speaking, you only get two. With the $329, 2.9-pound Swift 1, you're getting small and cheap, which means you'll have to skimp on speed—and in this case, the skimping is going to hurt. In the performance charts below, we've compared the Swift 1 to older (2016 to early 2-17) laptops with similarly low-end, low-powered Atom and Celeron CPUs. We've also thrown in a laptop with an older Core m3 mobile CPU, so you can see the difference when stepping up to Intel's highest-end chip family. Given the Acer Swift 1's mission to be a budget-priced ultra-portable for people looking to get things done (move along, gamers), I was particularly interested to see how the Swift 1 could handle daily productivity chores. The answer, according to our test results: It can, but only just. We use PCMark 8 Work Conventional to test a laptop's agility with tasks like browsing the web, running Office, and other everyday desktop duties. In our experience, a notebook needs a score of at least 2,000 to perform such chores without noticeable slowdowns. 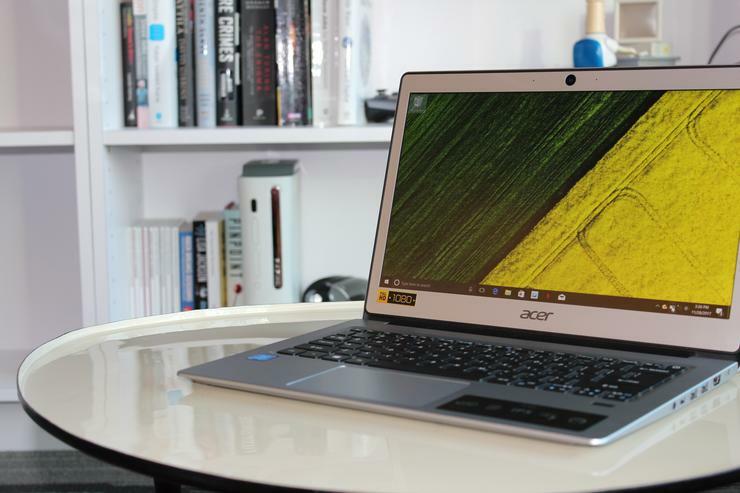 The Acer Swift 1's score of 1,934 in PCMark 8 Work 2 Conventional is disappointing, given that a score of 2,000 is the threshold for decent performance with mainstream applications. 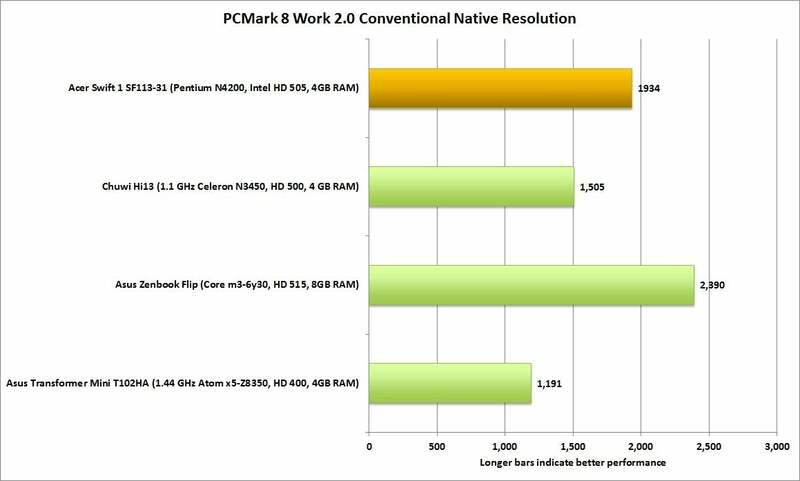 With its PCMark 8 Word benchmark score of 1,934, the quad-core Pentium-powered Swift 1 falls just shy of our expectations. Even while performing such mundane tasks as browsing the web, I could occasionally feel the Swift 1 straining with the effort. Button presses, page rendering, and menu opening frequently took a moment longer than they should. Just to be clear, the Acer Swift 1 is usable for daily productivity tasks—right now, at least. But a few years down the road, as its CPU is pushed harder by the latest Windows updates? That's the question you'll need to consider before snapping up a super-cheap ultralight like this one. We move on to Cinebench, a 3D-rendering benchmarking app that tests a laptop's performance under an intense CPU load. In a cohort of lower-powered laptops, the Acer Swift 1 posted an average score overall in Cinebench's single- and all-thread tests. 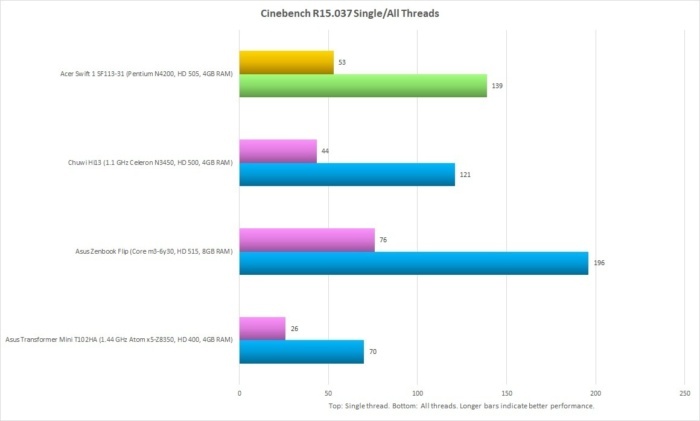 Quad-core laptops usually score high Cinebench results. But the Swift 1 runs on a quad-core Pentium processor, not a full-on Intel Core chip, and its dismal Cinebench figure reflects that fact. Again, there's nothing broken inside the Swift 1; this is simply the price you pay for a 2.9-pound laptop that's so cheap. Anyone who expects to rapidly render 3D images on a $329 ultraportable like the Swift is simply barking up the wrong tree. It's almost unfair to subject the budget Acer Swift 1 and its integrated Intel HD Graphics 505 core to gaming-oriented benchmarking apps like 3DMark Sky Diver 1.0. Not surprisingly, the Swift 1's overall score is among the lowest we've ever recorded. Again, though, something has to go if you're only going to pay $329 for a 2.9-pound laptop, and in this case, it's "Overwatch." Low-end integrated graphics results in a pedestrian score for the Acer Swift 1 in the 3DMark test. The picture gets a little brighter as we turn to the Acer Swift 1's battery performance. To test how long its battery would hold out, I loaded a 4K video file onto the Swift and looped it using the built-in Windows media player, with screen brightness at about 262 nits and the volume up halfway. 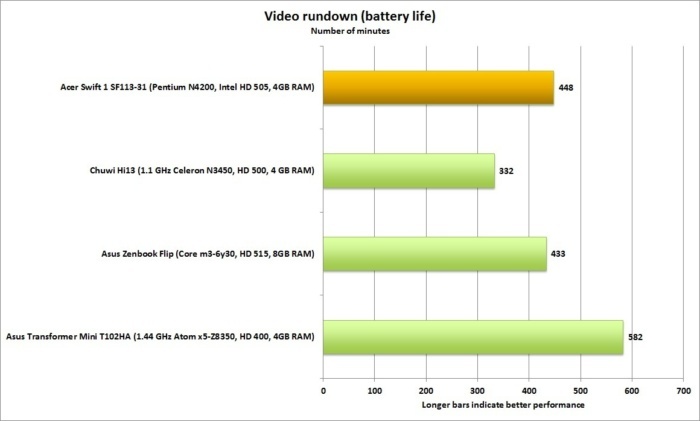 The Acer Swift 1's battery life on our video rundown test is about 7.5 hours, which is adequate. The result: an average of about 448 minutes, or almost 7.5 hours. That's shy of Acer's advertised 10 hours of battery life for the Swift 1, but it's still not bad considering the Swift's 3-cell, 42,000 mWh battery. The Acer Swift 1 is an ultra-portable that hits the sub-$350 price point by making a few hard choices. If you don't mind a puny solid-state drive and average performance, the Acer Swift 1 might be the laptop for you. For anyone else, though, I'd recommend forking over more cash for a faster ultra-portable (an expense that may pay off later in longevity), or settling for a bigger laptop without such steep speed compromises (like the $350 Acer Aspire E 15). At the very least, Swift 1 shoppers should upgrade to the $400 version with a roomier 128GB SSD.